NASA’s Juno probe has successfully arrived in Jupiter’s orbit. The satellite, which left Earth five years ago, had to fire a rocket engine to slow its approach to Jupiter and get caught by its gravity. A sequence of tones transmitted from the spacecraft confirmed the braking maneuver had gone as planned. Receipt of the radio messages prompted wild cheering at NASA’s Jet Propulsion Laboratory in Pasadena, California. “All stations on Juno co-ord, we have the tone for burn cut-off on Delta B,” Juno Mission Control had announced. 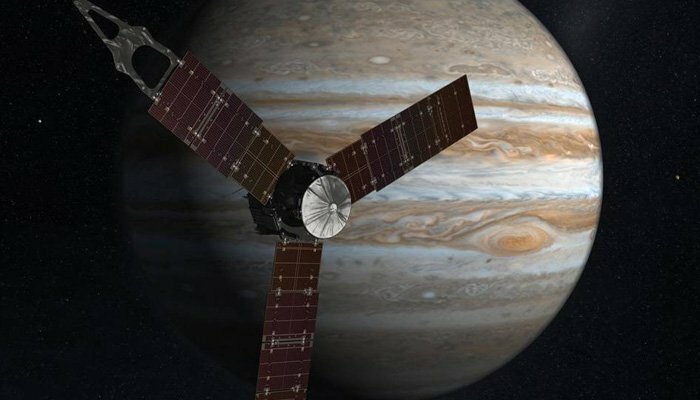 NASA scientists plan to use Juno to sense Jupiter’s deep interior. They think the structure and the chemistry of the planet’s insides hold clues to how this giant world formed some four-and-a-half-billion years ago. Engineers had warned in advance that the engine firing was fraught with danger. No previous spacecraft has dared pass so close to Jupiter; its intense radiation belts can destroy unprotected electronics. One calculation even suggested the orbit insertion would have subjected Juno to a dose equivalent to a million dental X-rays. Jumo is built like a tank with titanium shielding, and the 35-minute rocket burn appeared to go off without a hitch. While the radiation dangers have not gone away, the probe should now be able to prepare its instruments to start sensing what lies beneath Jupiter’s opaque clouds. July 5 orbit insertion has put Juno in a large ellipse around the planet that takes just over 53 days to complete. A second burn of the rocket engine in mid-October will tighten this orbit to just 14 days. It is then that the science can really start. This will involve repeat passes just a few thousand of miles above the cloudtops. At each close approach, Juno will use its eight remote sensing instruments – plus its camera – to peer down through the gas planet’s many layers, to measure their composition, temperature, motion and other properties. A priority will be to determine the abundance of oxygen at Jupiter. This will be bound up in its water. The probe will also try to settle old arguments over whether the planet hosts a solid core or whether its gases go all the way down to the centre in an ever more compressed state. It will look for the deep swirling sea of liquid metallic hydrogen that theory suggests is the driver behind Jupiter’s immense magnetic field and its spectacular auroras. NASA plans to run Juno through to February 2018, assuming any radiation damage has not made it inoperable by then. The performance of the camera is expected to degrade rapidly within a few months. In line with the practice on many previous planetary missions, Juno will be commanded to end its days by ditching into the atmosphere of Jupiter. This ensures there is no possibility of Juno crashing into and contaminating the gas giant’s large moons, at least one of which, Europa, is considered to have the potential to host microbial life.